Today's software of the day is a little app called Wifind. WiFind shows you if wireless networks are locked or unlocked and their signal strength - right in the airport menu. 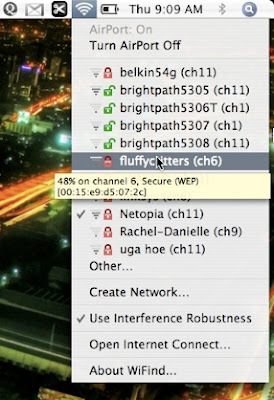 It's a tiny lightweight plugin for OS X that makes connecting to reliable wireless networks quicker and easier. Whether you're at home, the office or at your favorite cafe - WiFind will help you locate a signal and start browsing!" If you're on the move a lot, like I am, the $8 price tag is well worth it in saved time alone. No longer do you have randomly click on networks until you hopefully find an open one. Wifind can be downloaded here.